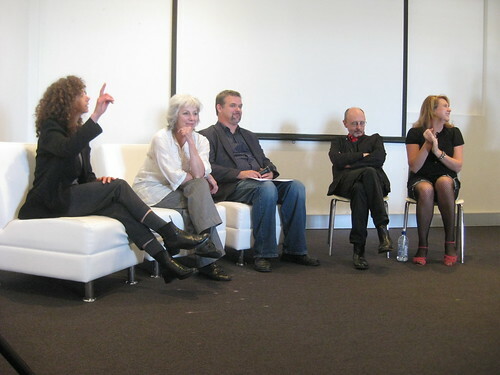 We had a terrific time with our six presenters at the AAANZ conference in Brisbane this week. We’ve posted a document over here which outlines the theme of the discussions, as well as how we divided up the conversation, and the abstracts from our presenters. Thanks to presenters Sandy Gibbs, Steven Ball, Georgia Banks, Greer Honeywill, Elizabeth Pulie, and Simone Hine. Australia has lost a legend of cinema. Albie Thoms’ obituary appeared in the Sydney Morning Herald yesterday. And another one from ABC MovieTime. Never bowing to overtly conventional cinema, this modest, knowledgeable and catalytic artist absorbed the history of the avant garde in Europe and became a lifelong avant gardist himself, with a uniquely Australian taste. Before funding was provided to some filmmakers by state and federal government, Thoms and his mates, like Bruce Beresford, Garry Shead, Aggy Read, David Perry and others, grabbed 16-millimetre cameras, trekked into the landscape and aggressively started filming. The critic Charles Higham immediately praised the first films. This resulted in an uncensored Australian cinema in aesthetic and moral synchronisation with a worldwide ”underground” film movement. 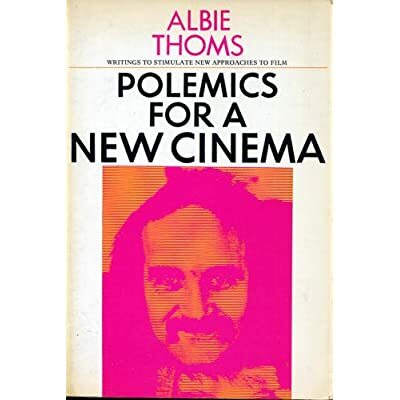 If you can, get Thoms’ book Polemics for a New Cinema – it’s a terrific chronicle of alternative cinema in the 1970s. The Ubu lightshows grew out of the happenings staged as part of “Theatre Of Cruelty.” In one of those we projected a film over an actor being disrobed as he recited a poem. The interface between moving actor and moving film image was fascinating, and recurred when we projected films over rock bands. Then the bands began reacting to the films, resulting in improvisations between musicians and lighting operators, and soon we were making films expressly for such performances, scratching and handcolouring black leader and painting onto clear leader. Eventually they were projected on the audience as well as the musicians, creating a mass performance (in one case with 4000 people) in which cinema had expanded to fill the room. I leave you with this piece from Jim Knox, reflecting on Thoms’ film Marinetti… as Knox says, “not for the puny lobed”! Sue K & the Nanolab gang have announced their collaboration in presenting the Australian International Experimental Film Festival http://www.aieff.org. Put this one in your diaries! Festival dates Melbourne, 30th April, 1st-2nd May, 2010. Submissions mid Dec 2009 to 15th Febuary 2010. The fabulously energetic Mark Williams at the NZ Film Archive is poised to screen the documentary essay Conceptual Paradise: There Is a Place for Sophistication. Unfortunately this screening is in Wellington, NZ, not much good to us at present but maybe someone in the community will be spurred to show it! Hope so! The film is directed by Stefan RÃ¶mer traces out the debates that allowed the intellectual art movement of conceptual art to emerge in the 1960s, and which has subsequently led to the most relevant questions in contemporary art. As Mark’s e-mail today said, it features some of the most interesting and dynamic artists and art theorists alive today, presenting a diversity of voices to show conceptual art as a socio-historical development of various movements; that it has no one valid definition. Yet there are several ideas that are framed throughout the documentary; the fiction and ideal of art as political engagement; the history of art as a history of struggles around strategies of representation, and, in making a film about conceptual art, the trope of reflexivity that produces a study on the documentary as a genre in itself. Alexander Alberro, Benjamin H.D. Buchloh, Sabeth Buchmann, Charles Harrison (Art & Language), Geeta Kapoor, Geert Lovink, Seth Siegelaub, Gregor Stemmrich. It’s rare enough to see a serious exhibition of video art in an Aussie art museum. But accompanying the MCA’s Video Logic show, there is a super rare screening of historical Australian video works. I’ve cut and pasted the screening program below (it’s also available here as a printable pdf). Also if you scroll down further, I’ve pasted details about the DISAPPEARING VIDEO CONFERENCE, at which the TLC’s Louise Curham will be speaking about preservation and conservation strategies for this most unstable of media. Louise recently contributed a chapter on audio-visual preservation to the 3rd edition of Keeping Archives. the narrative. This talk seeks to remind us of the broader intentions. Related to the physical loss of works whose material existence is bound to inherently unstable media formatsâ€”and equally concerningâ€”is the disappearance from public memory of Australian work from â€˜the foreign country of the pastâ€™. With discussion of â€˜forgettingâ€™ or the evaporation of the immaterial, Zuvela will canvass strategies to inoculate against such disappearances, and suggest ways to bring about a more active remembering of Australiaâ€™s rich creative history. As an artist, theorist and critic, Conomos engages with the ongoing intertextual adventure of seeking new horizons of image, sound, performance and text. From this perspective he shall discuss the historical context of Australian cinema, video and media art. In a discussion about how we make good archives for video art, Curham proposes an emphasis on context. Thinking through the role of the material form of the work, there is discussion about which properties of the original matter. What and where is the video artwork and what is the role of the original maker? How will we meaningfully pass these artworks on to future generations? How faithful do these need to be? These considerations will touch on practices in existing time based art archives and will think about what Australian archives of media art might look like. Thoughts on technology / video / art / sustainable practice, the ephemeral object and the art system. Video art has achieved an unprecedented level of visibility over the past 5 years with new opportunities for artists and the public to engage with what was once a marginal practice in contemporary art. But what does the future hold for video art? Has the outsider finally joined the mainstream? Or will the recalcitrant medium cling to outmoded methods of production and distribution in an effort to maintain critical purity? And what of the evil art market, the web and iTunes? John Conomos is a media artist, critic, and theorist who extensively exhibits locally and internationally. His art practice traverses a variety of art forms and deals with autobiography, identity, memory, post-colonialism, and the â€œin-betweenâ€ links between cinema, literature, and the visual arts. Conomos is a prolific contributor to art, film and media journals and forums. In 2000 he was awarded a New Media Fellowship from the Australia Council for the Arts. His essays on cinema, video art and new media were recently published as Mutant Media (2008), and with Brad Buckley he co-edited the anthology Republics of Ideas (2001) and the forthcoming Rethinking the Contemporary Art School, to be published September 2009. Conomos is an exhibiting artist in the MCA exhibition Video Logic, 2008. Louise Curham is at the forefront of Australian moving image art. Well known for curating innovative expanded cinema events in non-traditional exhibition spaces, Curham is highly regarded in the experimental film world for her work using â€œobsolete mediaâ€. She is involved with Teaching and Learning Cinema, a filmmakers and film lovers group with a focus on re-presenting moving image works from previous generations in events that encourage discussion and break down the passivity of looking at images. Alongside Curhamâ€™s practice is her work as an audiovisual archivist, a field in which she has worked since 2002. Andrew Frost is a writer, art critic and journalist. He is the co-founder and editor of The Art Life and writes and presents television programs on contemporary art for ABC1. He is the author of the forthcoming Burn to Disc: Contemporary Australian Video Art, to be published in 2009. John Gillies is an artist working with film, sound, installation and video, and often in collaboration with performers from a variety of disciplines. Gilliesâ€™ screen work has been shown in festivals such as Videobrasil, Ars Electronica and the London, Sydney and Melbourne film festivals. He is an exhibiting artist in Video Logic at the MCA. Ross Harley is an artist, writer, curator and educator in the field of new media and popular culture. His work crosses the bounds of cinema, music, art, design, architecture and media art practice. From 1986-91 Harley edited the influential art theory journal Art + Text. In 1992 he was the director of the influential International Symposium on Electronic Art, ISEA. Harley has edited a number of anthologies and conducts diverse research projects extending the electronic media art practice and theory. Lyndal Jones has a long history of working with new media, video and performance art in Australia. Jones has produced an extensive body of work since the early 1980s, and is known for creating long-term projects which initially focused on performance then video installation. Throughout, her works have addressed the power of the experiential and the development of interactivity. Jones represented Australia at the 2001 Venice Biennale, and has shown her work at numerous galleries throughout Australia and overseas. Dr. Stephen Jones is an Australian video artist of long standing and independent curator of electronic art. For many years (1983-92) he was the video-maker for the electronic music band Severed Heads. He is an experienced video editor and electronic engineer having developed equipment ranging from analogue video synthesisers to DVD synchronisers, and currently builds interactive installation devices for artists. He also provides conservation and preservation services in the electronic and video arts. Jones has recently completed a book on the history of the first generation of the electronic arts in Australia. co-curates the OtherFilm Festival, a 4-day festival of expanded, participatory and performative film and music. Reel Rescues is an exhibition of home movies, silent films and original newsreels, acting as a time capsule of Queensland life from the 1920s through to the 1970s in moving image form. The show is co-curated by OtherFilm’s Sally Golding (along with Bryony Nainby) and features Golding’s conservation work, with detailed studies of beautifully deteriorated film frames. Reel Rescues also features contemporary film works dealing the broader notion of ‘the archive’ by artists Jim Knox and Kerry Laitala, and a new sound piece ‘Sonic Projection’ by OtherFilm’s Joel Stern. Reel Rescues, SLQ Gallery, Level 2, until Dec 2nd 2007. Free Entry. This series focuses on the enduring traditions and lasting influence of experimental and avant-garde filmmaking. This is so-called formalist cinema, using film in ways that are comparable to the aims of modern painting and sculpture, foregrounding the medium itself, emphasising the film strip, the frame, montage, projection, and even the chemical and technological processes. The rejection or subversion of Hollywood-type storytelling generates works with a loose or non-linear narrative, making unexpected dislocations of time and space, permitting personal explorations and poetic or ironic juxtaposition. Taken together, these journeys of colour and sound demonstrate the sheer dynamism of experimental cinema over the past 85 years.